Donald Trump chose to skip a profoundly significant ceremony this past weekend at an American cemetery in France to commemorate a World War I battle. He sent White House chief of staff John Kelly and Joint Chiefs of Staff chairman Gen. Joseph Dunford to stand in the rain, something the president declined to do. The event was part of a weekend commemoration of the 100th anniversary of the end of World War I. Trump managed to bungle and blunder his way through the weekend, isolating himself and the nation he leads from key allies. The WWI battle took place in Belleau Wood, an event that is sacred in the minds of U.S. Marines. It was the first fight that sent Marines to fight a foreign enemy force. They fought valiantly and brilliantly against the German forces at Belleau Wood. The cemetery where the Marines are buried is sacred ground anyway, but it especially so to Marines. Kelly is a retired Marine general; Joseph Dunford is an active-duty Marine general. I am wondering how these two men must have felt when they got word that the commander in chief had declined to attend the event because of reported “logistical” concerns created by the weather. The White House cooked up some pretext about Marine One, the presidential helicopter, being unable to fly in rainy conditions. The president could have driven to the ceremony. He chose to send Kelly and Dunford instead. I would feel sympathy for Kelly in particular, except that he chose to sign on as chief of staff presumably knowing he would be working for someone who is prone to toss traditional customs aside. The president managed to disparage the Marine Corps with his no-show at a solemn event. He also continues to shred the reputation of his chief of staff. Now it’s a hoax, Mr. President? Which is it today, Mr. President? You said just the other day that the Russian attack on our electoral system in 2016 occurred. You accepted finally the U.S. intelligence agencies’ view that the Russians did it. Then you send a message out today that calls it a “hoax”? Let’s look back for a moment. All of our nation’s intelligence bosses — FBI, CIA, director of national intelligence, National Security Agency, the Joint Chiefs of Staff — have been singing off the same hymnal page. The Russians did it! They acted alone! You have denigrated their work. You have stood next to the Russian president and accepted his lying, prevaricating denial. Then you backed off of that and said you now believe the U.S. spooks. Now you call it a hoax. Man, oh man. I am getting confused, Mr. President. You’re making my ears bleed. My head is spinning. I need smelling salts. I’m getting a case of rhetorical vertigo. You won’t listen to me. I mean, you don’t listen to DNI Director Dan Coats, or CIA Director Gina Haspel, or anyone for that matter on anything! I’ll offer this bit of unsolicited advice: Why don’t you just keep your unpresidential trap shut, let the special counsel, Robert Mueller, finish his job and then let the chips fall where they will fall? Did POTUS give away the store to Kim? 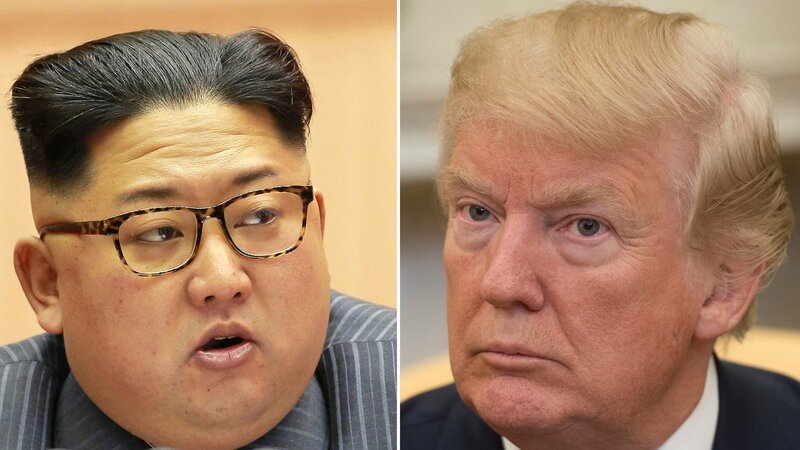 Honest to goodness, I want to give Donald Trump props for meeting with North Korean dictator Kim Jong Un and possibly start laying down the building blocks for a lasting peace on the Korean Peninsula. However, I gave some thought en route from Amarillo to Fairview about what transpired this week. I am wondering plenty at this moment about what the president has given away. Donald Trump has called this killer, despot and tyrant an “honorable” man. He has said his people “love” him. The president who once called Kim “Little Rocket Man” has now become his newest BFF. Then he decided to end joint military exercises with South Korea. Did the president consult with, oh, South Korea? Or with his own defense secretary, James “Mad Dog” Mattis? Or the Joint Chiefs of Staff? Oh, no. Trump did it on his own. Hey, he’s commander in chief, so I guess he is entitled to do whatever the hell he wants. How do you suppose Kim Jong Un responded to that idea? He well might have jumped straight into the air, high-fiving his top aides; he got what he has demanded all along! And did the president raise any issue about human rights, which do not exist in North Korea? Kim is starving his people. He is imprisoning them for no good reason. He orders the deaths of foes. Kim’s goons capture tourist and charge them with bogus allegations. Did the negotiator in chief bring any of this up with Little Rocket Man? I do not believe he did. Trump and Kim have signed a vague two-page letter committing to negotiate an end to nuclear weapons in North Korea. No promise that the North Koreans will actually get rid of them, just a vow to talk about it. I’m still hoping to cheer the president. I still want him to succeed for the benefit of the country. I still await some sign that Donald Trump knows what he is doing. I am afraid I must withhold the cheers. Donald J. Trump’s self-congratulatory tweet about Memorial Day seems to have produced a fascinating reaction from another prominent American. Do you think Gen. Dempsey had anyone in mind when he wrote about how the day “should not be about any one of us”? Defense Secretary James Mattis and Joint Chiefs of Staff Chairman Gen. Joseph Dunford are two serious men with equally serious outlooks on the state of the world. So, when these two men tell U.S. Senate inquisitors that Iran is not cheating on the deal that was worked out in 2015 to prevent development of an Iranian nuclear weapon, you’d like to believe the president would take that into account. Yes? Umm, no. It didn’t happen. You see, today the president of the United States, accused the Iranians of rampant cheating on the deal. Thus, he present an opinion that goes directly against the view expressed by his two top military advisers. Then he announced that the United States is pulling out of the 2015 agreement negotiated by the Obama administration and several our nation’s key strategic allies. I’ll add here that Secretary Mattis is a retired four-star Marine Corps general, the same rank as Gen. Dunford. I guess he knows more than the generals about Iran’s adherence to a nuclear deal, too. As a constituent of the president, I am going to believe the analysis provided by “Mad Dog” Mattis and Gen. Dunford before I accept anything that comes from the Liar in Chief. A former Joint Chiefs chairman says he is concerned that Donald J. Trump has surrounded himself with too many generals. Retired Navy Admiral Mike Mullen — who served as Joint Chiefs chairman under Presidents George W. Bush and Barack H. Obama — said that Defense Secretary James Mattis and White House chief of staff John Kelly, two former U.S. Marine Corps generals, lack “political experience.” The same can be said, according to Mullen, about former national security adviser H.R. McMaster, who is an active-duty U.S. Army lieutenant general. OK, I get Mullen’s concern. I’m not sure he needs to be overly concerned. I look at the generals’ presence a little differently. These men all have combat experience, which means they understand the consequences of war. It’s been said that warriors quite often are the last individuals who want to go to war. They know too well the grief and misery it brings. Admiral Mullen perhaps ought to be more concerned that the commander in chief is reluctant to listen the best advice he gets from those “best people” with whom he pledged to bring aboard his administrative team. What kind of game is this, Mr. POTUS? 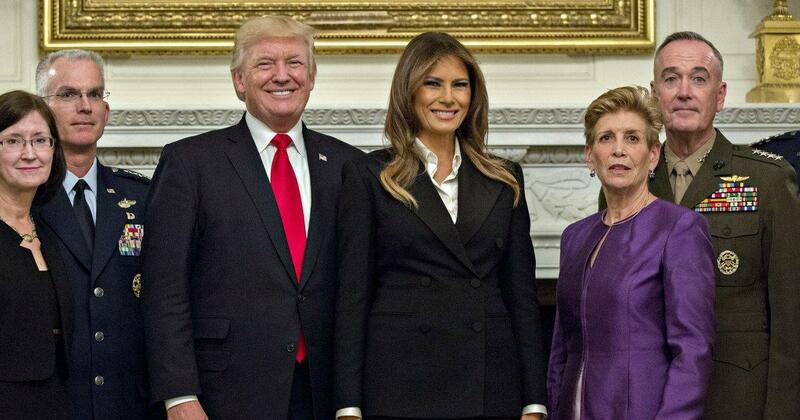 There he was, flanked on both sides by the Joint Chiefs of Staff and a cadre of senior military officers and spouses, not to mention his own wife, the first lady of the United States. So, what does Donald John Trump do? He tosses out a cryptic message about “the calm before the storm,” hinting that there might be possibly, maybe, perhaps something about to happen. A “storm” might be brewing. But … where? What kind of storm? A military one? A political one? A reporter asked the president what he meant. His answer? You’ll find out. Huh? Eh? What the … ? What is this clown doing? Why does he say these things? Why does he flap his yap so gratuitously, leaving the nation guessing on what he means, what he’s saying and wondering whether we’re about to go to war? Is this what all those Trumpkins of this nation mean by “telling it like it is?” If so, then I’m left to wonder what the “it” means. But, Secretary Perry, are transgender warriors less brave? Rick Perry says he is in total support of Donald John Trump’s decision to bar transgender Americans from serving in the armed forces. Of course he is. He’s part of the Trump team now. The president forgave Perry for labeling Trump a “cancer on conservativism.” His reward was to appoint him secretary of energy. The president, though, didn’t talk to all of the generals. 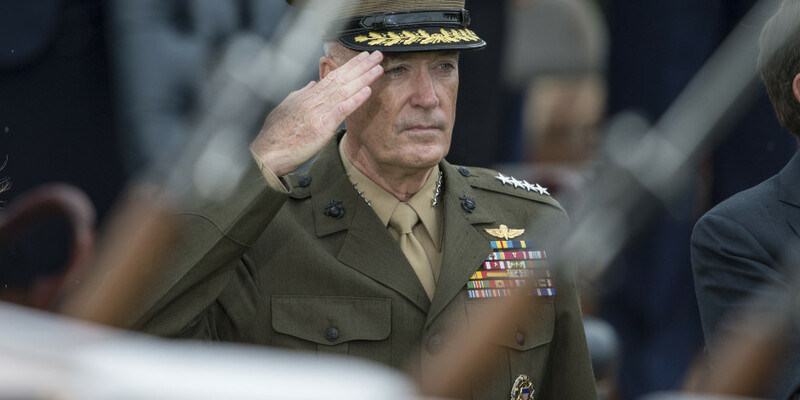 Joint Chiefs of Staff Chairman Joseph Dunford declared that all personnel would be treated with “respect,” and that no policy changes would be enacted until the order came from the defense secretary. It’s that thing called “chain of command” that has given Gen. Dunford pause. As for Perry’s support of Trump’s decision, he said the government shouldn’t have to pay for surgeries in which personnel change their sexual identity. Reporters reminded him that studies showed the cost of such procedures amounts to about 10 percent of the money the government pays to provide medicine that cures erectile dysfunction. Neither the president or his energy secretary, though, have yet to produce any evidence that transgender military personnel are less capable than any other of their comrades in arms. Nor have they have provided proof that they are less patriotic, less loyal or that they don’t love their country as much as anyone. The president has used Twitter to make a policy pronouncement without considering for a moment what it means. I would have expected better from the secretary of energy — himself an Air Force veteran — if not the know-nothing commander in chief. Donald John Trump has compiled an endless list of broken campaign promises. I’ll take a glance briefly at just one of them. He vowed to become more “presidential” once he took the oath of office. He hasn’t done so. He’s become even less presidential. Consider his latest blockbuster tweet in which he declared that transgender service personnel no longer could serve their country. He is governing by Twitter. The tweet caught the Joint Chiefs of Staff, congressional committee leaders, the Department of Defense and military field commanders all by surprise. The president fired off the tweet and then — bang! — ignited a firestorm. This idiotic tweet has provided yet another glaring, glowing and ghastly example of how the commander in chief is not fit for the position he occupies. Senate and House committee leaders have expressed dismay that the president would govern via this social medium. The president, who never wore the nation’s uniform, has disrespected a handful of patriotic Americans simply because they have sought to change their sexual identity. As a brief aside, I’m now awaiting a comment from my congressman, Mac Thornberry, who chairs the House Armed Services Committee. His Senate colleague, John McCain, already has spoken about the president’s latest Twitter tempest and the idiocy associated with the president’s insistence on using Twitter to make sweeping policy pronouncements. Where are you on all this, Mac?